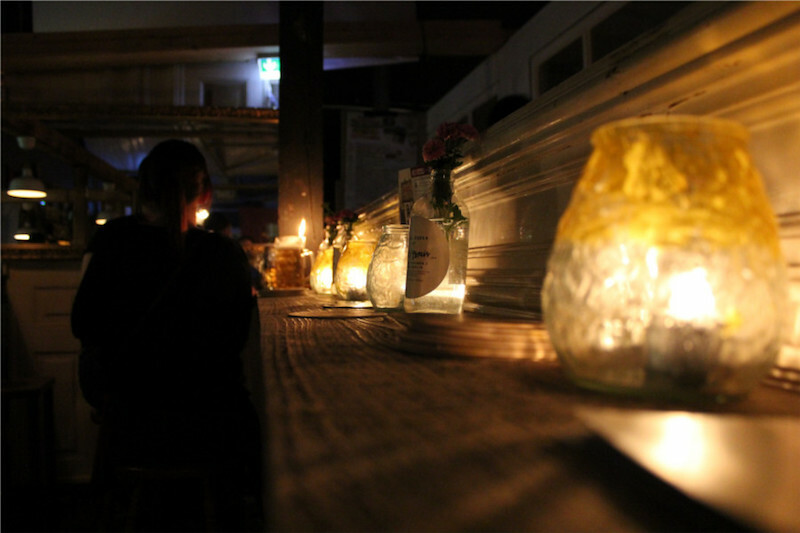 On a regular basis you can find articles about real Berliner-Clubs on this blog. There are plenty of these unique clubs in Berlin and they are hard to find in any other country in Europe. 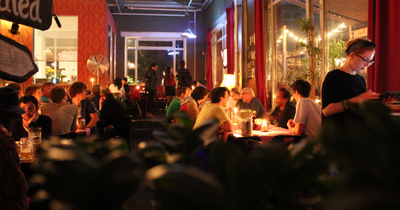 But besides clubs Berlin also has many unique bars and restaurants. The choice between party and food is hard sometimes, but White Trash Fast Food offers a bit of both. White Trash Fast Food used to be located in a beautiful building in Prenzlauer Berg but unfortunately this year they were forced to leave that building after many succesfull years. 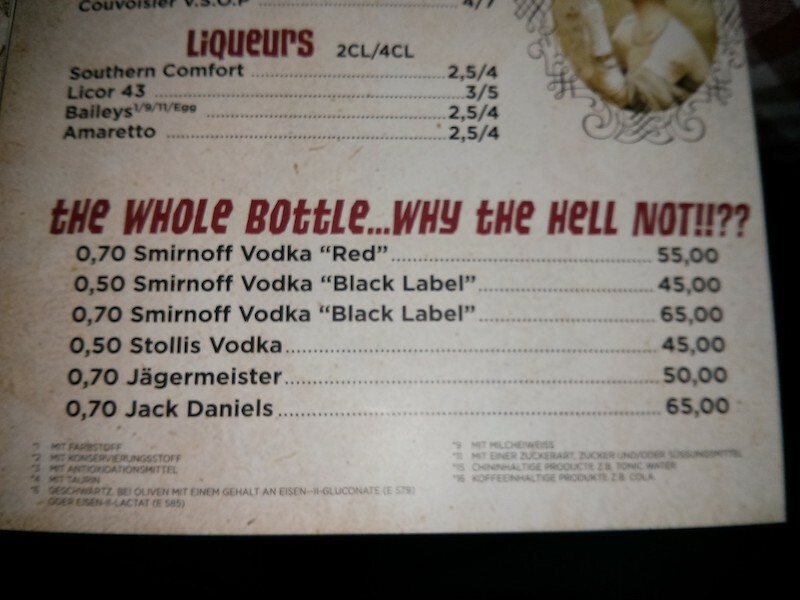 Lucky enough Berlin did not have to live without White Trash for a long time: A new restaurant was opened close to Treptower Park and White Trash did not lose its famous flair and style. The new restaurant has a large garden, the same great burgers and also the tattoo-shop survived the relocation. 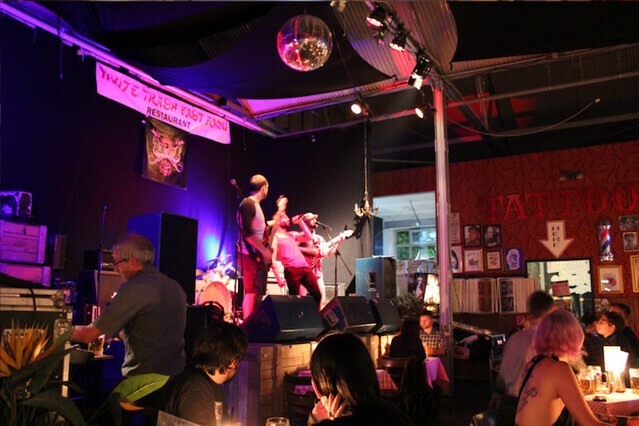 As mentioned above, White Trash did not lose his cool style: There are still heaps of funny decorations and the atmosphere is still very leisure and laidback. 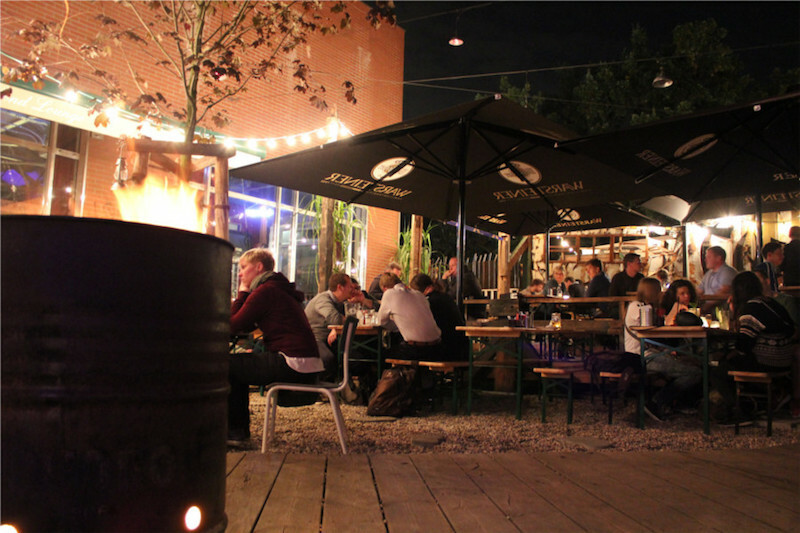 The fact that Berlin loves White Trash was clear when the new restaurant turned out to be as popular as the old one. For that reason it is still advisable to make a reservation if you want to eat inside the restaurant. 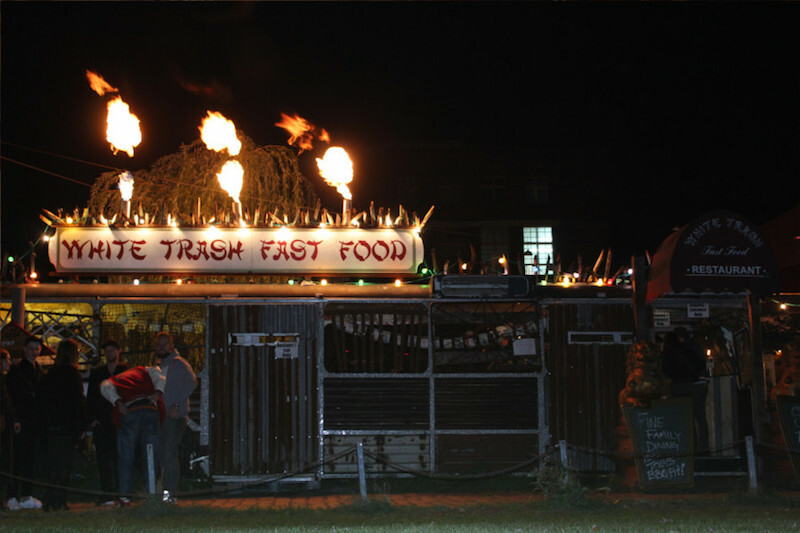 The menu of White Trash represents the style of the restaurant: Its Humoristic and unique. Especially the burgers are quite famous in Berlin and I know from my own experience that they taste delicious. 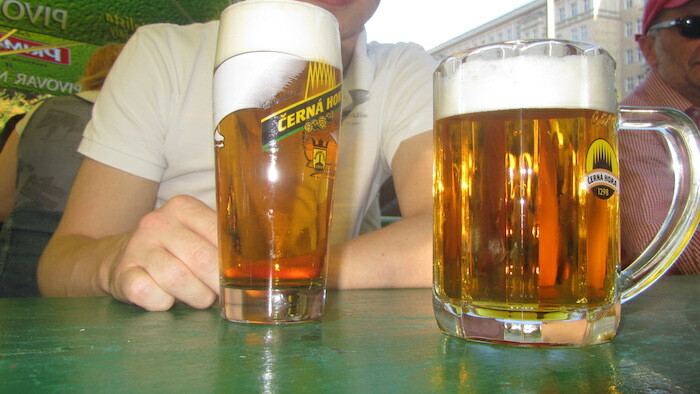 But besides burgers you can also order schnitzel, steak, scampi’s, buritto’s and many other dishes. The price of the food in White Trash is a bit above average for Berlin but still very reasonable, most dishes can be bought for 8-12 Euro. The large garden outside is great for some having drinks with some friends. The rules are a bit different than inside the restaurant: You can pick up your food at the kitchen yourself and there often barbecues and events outside as well. It is not busy as inside here and you do not need a reservation to eat here. Besides some nice dishes and a humoristic menu, the White Trash has more to offer. 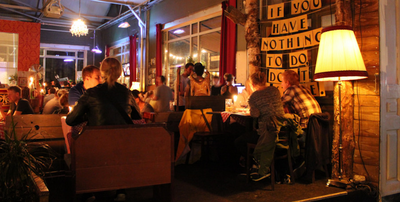 Later at night many Berliners visit White Trash for a drink and because of their daily evening-program. Sometimes there are cool activities and games and on other nights you can find a band or a DJ. The full programm of White Trash can be found on their website. 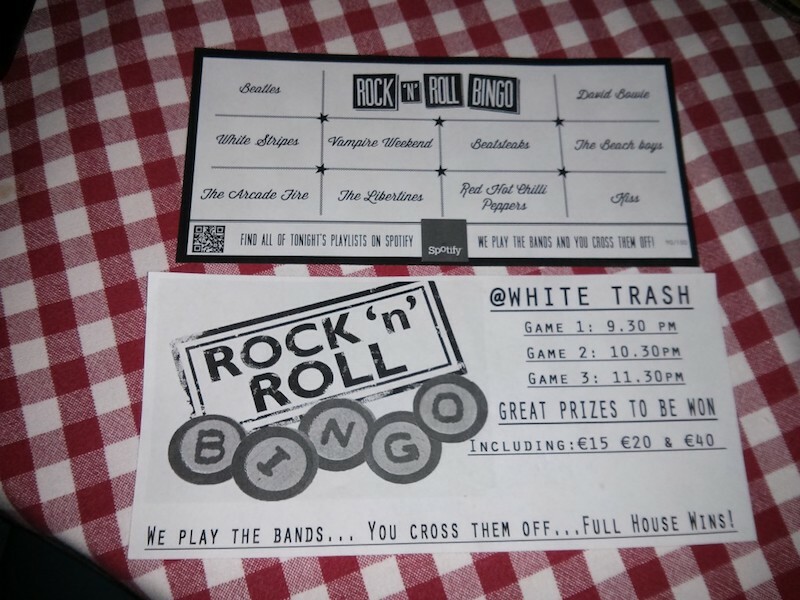 Personally I would recommend visiting White Trash when there is a Rock&Roll Bingo night. 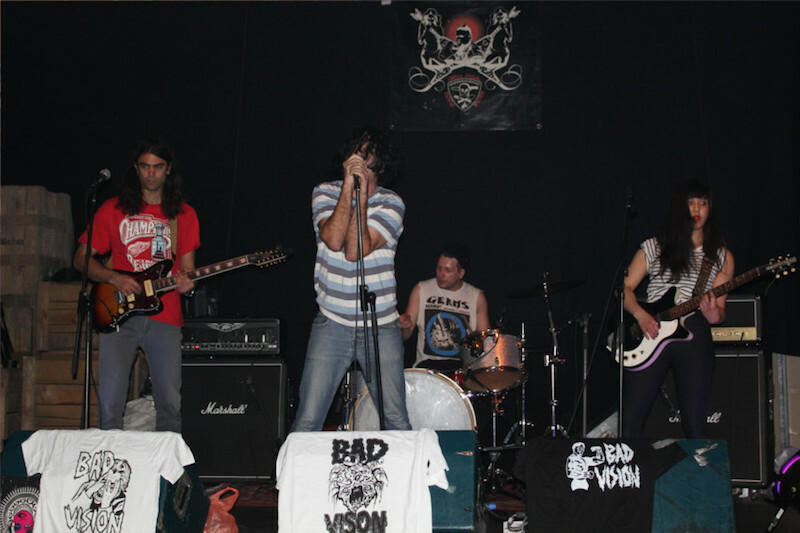 A perfect example of one of the cool activities of White Trash is the Rock and Roll Bingo. Once every few weeks all visitors receive a bingo-card with the names of 10 different bands on it. Then the DJ will start playing songs and if you hear one of the bands on your bingo-card you have to stripe it away. When your card is full you can run up to the DJ for cool prizes or free drinks (See image below). White Trash is defenitely one of the bars + restaurants in Berlin which you should visit when you want to experience the real Berlin. The unique style, great atmosphere and funny evening-activities will offer you a great evening. 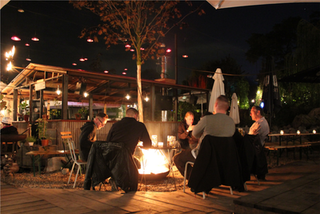 White Trash restaurant can be reached easily from station Treptower Park and Schlesisches Tor, the exact address is Am Flutgraben 2. Keep in mind that it is normal to pay a few euros entrance because you will be able to enjoy the music and evening-programm. Below you can find all the information about White Trash together. I like the place and I will definitely reserve a table before my trip to Berlin. By any chance, do you happen to know any bar (not club) in Berlin which plays deep or progressive type of house music? or just a good lounge vibes..